A big thank you to everyone who helped over the festive period! Over the Christmas period our services were able to put on a lot of event for our members thanks to the wonderful work by our corportate volunteers. Thanks so much to Peter and the fantastic Lloyds volunteers who bought, prepared and served an amazing Christmas Dinner to 60 members of our Mental Health and Wellbeing service. The team have been supporting members in IT training and a huge thank you for all their hard work over the year and for a really special christmas dinner event. 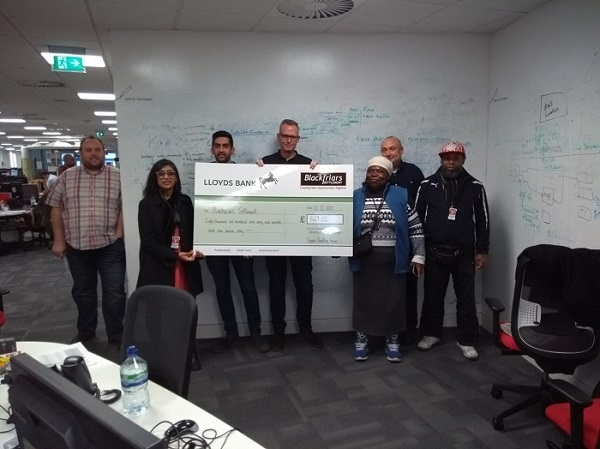 Alan and the amazing Lloyds volunteers raised an amazing £11,699 for the Mental Health and Wellbeing service through Challenge 100. Alan’s team were each given the task of raising £100 and many of them exceeded this target through fun and adventurous fundraising activities including, cycling to Stella in Belgium, 10k run, pie face, yoga sessions, tough mud, penalty shoot outs and many more. Thanks so much for their amazing efforts and the money raised will really help towards our members’ therapeutic annual away week and refurbished computers for the IT training suite. Thanks to Charles Russle Speechleys LLP, who invited members of our Crusoe Club for the Visually Impaired Elders for a special celebration Lunch. They were given transport to the CRS office, where we were treated to a very special meal with lots of trimmings. Farther Christmas Visited and all the members who presented them with a hamper each. There was so much of fun and laughter. 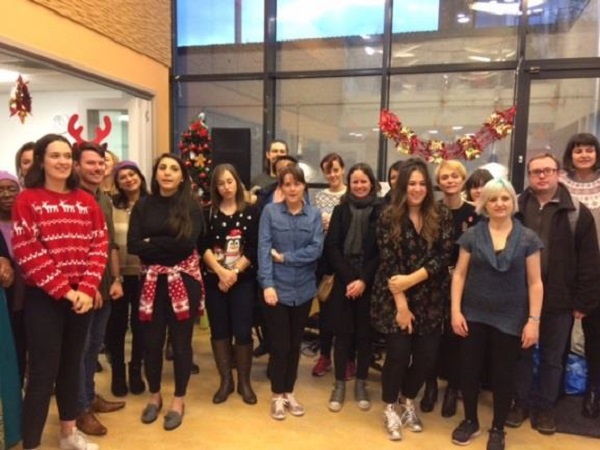 Thank you to the volunteers from American Express, organised by Hands-on-London, who helped in preparing lunch for our Christmas Lunch for all our members on the 15th December. 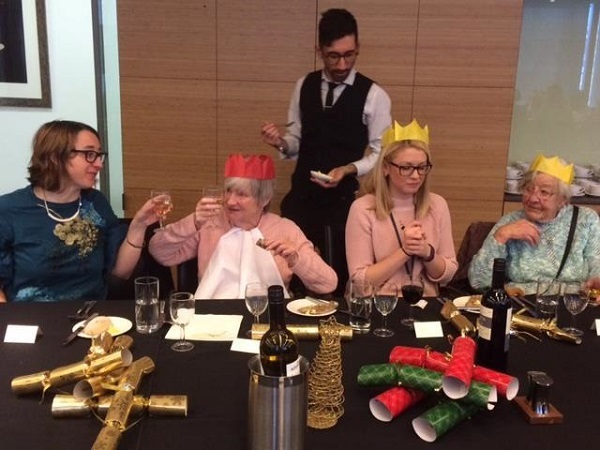 Positive Ageing @ Blackfriare had their Christmas Lunch for all our members on the 15th December. This is always the most vibrant event of our services for the year. 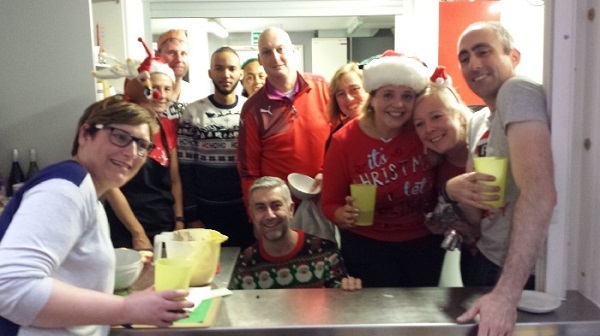 We served over 130 Christmas Meals for our members and our corporate volunteers who helped us on the day. 40 volunteers from, Informa through Benefacto, UBM, and Churchill Business Insurance, started the day at 8.30am. Carving the meats, Setting up two halls, and the Atrium area, cooking all the prepared dishes to make sure we served the meal at 1.00pm. It was no heavy task for our teams of volunteers. We had a free Christmas Gift Draw, and distributed over 80 gifts to attendees. So many gifts were donated to us by local businesses, organised by Better Bankside, and from Charles Russell Speechlys LLP. More donations towards the day were given by American Express, VIB Capital Bank , Dentons, and Moore Europe Capital Management LLP. The Services Lunch was partly funded by BlindAid and Southwark Charities Funded the Tea-Dance to follow the Lunch.